Most of the movies I end up seeing for my job here at ComicsAlliance are assigned to me. Transformers 3, Breaking Dawn, even the stuff like Hunger Games that I end up enjoying are handed down from on high as things that, like it or not, I have to do. It's a rare occasion that I actually ask for one, but when I saw the trailer for Lockout and heard someone actually say the words "there's been a massive takeover at Space Prison," I skipped straight to pleading. I had to see this movie. And it was everything I wanted it to be. Well, maybe not everything, and I might as well start with the one major disappointment of the film. Despite the fact that its presence in the trailer accounts for at least 30% of the reason that I wanted to see Lockout, the exchange "He's a loose cannon!" "But he's the best we've got!" never actually appears in the movie. I assume that they're going to put it back in for some kind of special Loose Cannon Edition™ when it hits Blu-Ray, but still, realizing they weren't going to say it on the big screen was heartbreaking for the thirty seconds I had to dwell on it. And then Guy Pearce blew up someone's head with an explosive necklace that looked like a bike lock, and all was forgiven. Here's the premise, in case you haven't been able to piece it together from what I've already written: In a future that's distant enough to have space stations with artificial gravity but not so distant that people don't still use iPhones, America has constructed Maximum Security One, a space prison where the most violent and uncontrollable offenders serve out their sentences in a cryogenic stasis that has the unfortunate side effect of occasionally driving them even more insane. 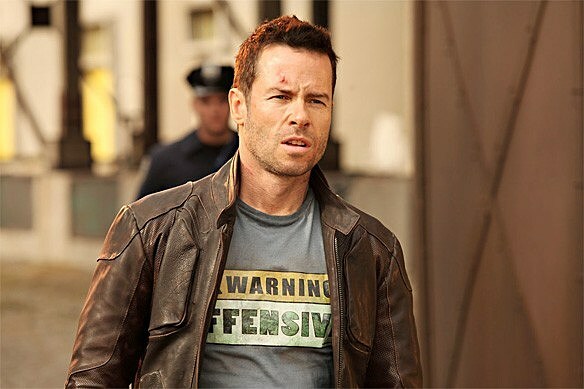 Their newest inmate is set to be Snow (Guy Pearce), a renegade former government operative wrongly accused of treason. Fortunately for him and unfortunately for pretty much everyone else involved, a lunatic with a truly incomprehensible Irish (?) accent called Hydell (Joseph Gilgun) manages to start a riot and unfreeze the convicts, taking the President's daughter Emilie (Maggie Grace) hostage during her inspection of the prison. Yes: the President's Daughter is inspecting Space Prison. It's sort of a Human Rights thing. So of course, it falls to Snow and his hilarious name to infiltrate Space Prison, rescue the President's daughter and kill as many convicts as he can. And it only gets more ridiculous from there, as Lockout gathers up as many action movie cliches as it can and then throws them into space. 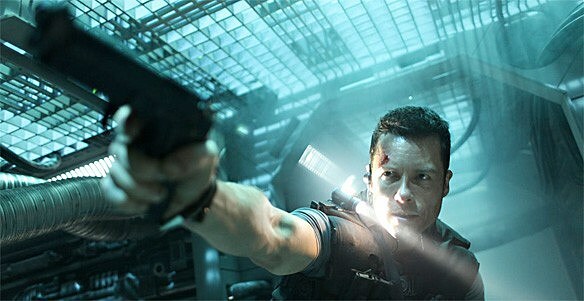 The more critical reviews of Lockout have called it derivative, and they're not wrong. There's not really anything new in this movie, and it draws heavily on everything from Total Recall to Escape From LA to Con Air without even bothering to hide its influences. 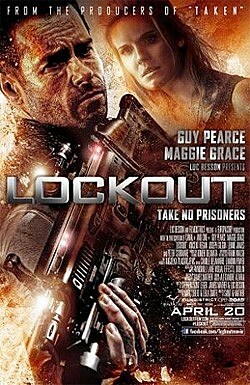 I think we can all agree that "Lockout" is a far worse title than "Space Prison," but if they wanted to go for they could've just called it "Die Hard In Space" and had the most accurate movie title ever. I swear to you, there is even a friendly space-cop on the other end of a space-waklie talkie helping Snow deal with the crap from the space-feds. It's hilarious. That said, calling it "derivative" doesn't feel quite right to me, probably because directors James Mather and Stephen St. Leger and their co-writer Luc Besson (who wrote and directed one of my favorite action movies of all time, Léon: The Professional) are so completely up front about what they're doing. At the New York Times, Adam Sternbergh had an interesting article about the death of the American action movie as a genre defined by films like Commando and Die Hard. I'm not sure I entirely agree with him -- I'd hold Crank and Crank 2 up as two recent movies that are fully embracing American action movies and taking them to a whole new level -- but he makes a lot of good points that I've had mind since I read it. The film that prompted it was the Indonesian The Raid: Redemption (a movie I haven't seen yet but am definitely looking forward to catching) but a lot of it speaks to what's going on in Lockout, too. Mather, St. Leger and Besson created something that's as far from an American action movie as it can be -- French filmmakers shooting in Serbia with an English star -- but it still feels like a throwback. In a good way. It all comes together in the form of Snow, and Guy Pearce does a great job with it. He's just so bored, and while an affected disinterest might hinder a lot of performances, it actually works really well here. It's kind of the perfect synthesis of John Matrix's casual killing machine and John McClane's grumpy everyman. And Pearce plays up to it, too . I mean, honestly, the first thing this guy says in the movie is a line about "plowin' your wife" as a response to an interrogation as someone is punching him in the face. He is clearly not all that concerned with what's going on, and it sets up his entire character for the rest of the film. He's laconic almost to the point of parody, but he manages to pull it off, especially in scenes like the one where casually decides to sacrifice his own life to save Emilie. His detachment and sarcasm take on an emotional weight for a brief moment that completely validates him as a character. And, spoiler alert, he doesn't end up dying, largely because he's the hero in an action movie. The only real problem with it is that, believe it or not, Lockout doesn't quite go far enough. It is essentially -- and very obviously -- a standard-issue prison riot flick just transferred directly into space, and there's almost nothing done to tailor the action to its environment. Seriously, it is to the point where there is a Space Police Department, fully staffed with coffee-drinking detectives in white shirts and ties, on another space station that seems to have absolutely no reason to exist. The Space Police and the Space Prison appear to be the only things in orbit. This is amazing. The movie does, however, do a pretty good job of ratcheting up the stakes. This is a movie that introduces two villains so that it can hit both sides of the Hans Gruber / Bennet From Commando coin, and then just keeps introducing new reasons for Snow to be worried in the hopes that one will eventually stick. He has to clear his name, he has to rescue the President's daughter, he has to figure out how they're going to escape, and also Space Prison is going to fall on the Eastern Seaboard and kill everyone unless he can stop it. But even with the truly ludicrous Deus ex Machina way that Snow and Emilie escape from Space Prison -- I didn't want to spoil it for anyone, but for real you guys, they jump out of space and land in Los Angeles with parachutes, it's fantastic -- it doesn't measure up in a world where Mark Neveldine and Brian Taylor exist. Of course, I don't think Mather, St. Leger and Besson are trying to outdo their contemporaries. I think they're trying to create -- and I've been dreading saying this, but since the movie has no such worries about dropping a cliché, I will -- an earnest love letter to that era of American action movies with wry renegade agents and their post-kill puns. I had a great time watching this movie in the theater, but to be honest, I'm pretty sure the best format for Lockout would be a VHS cassette taped directly from HBO.